. :Textiles, Regalia & Ritual Gear:. Early GSP (?) group portrait of twelve men in Improved Order of Red Men member buckskin regalia. 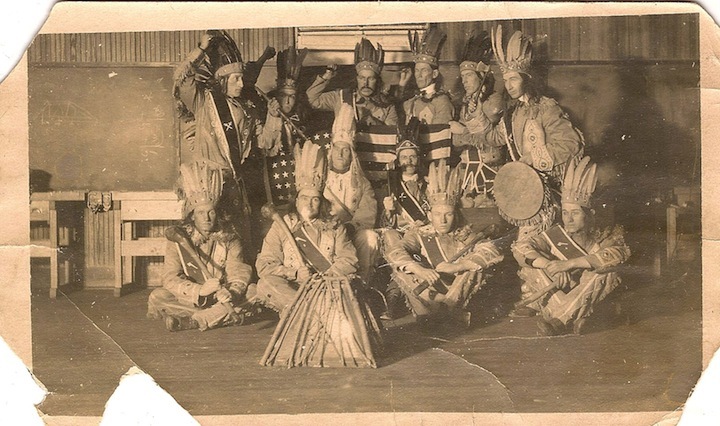 All wear bucksins, sashes (some with officers’ emblems), and tall feather headdresses. Most are holding clubs, tomahawks, or spears, and the back row of men comically menace their seated fellows with their weapons. They are seated and standing three-deep, with a fake campfire in front of them. An electrical cord can be seen trailing out of the top of the campfire, and a light comes from within, suggesting a light bulb. The back row of figures hold an American flag which appears to have star design that dates this photo between 1912-1956. The men range in age from young (20-ish) to middle aged, and display various levels of interest in the photo. Few make eye contact with the lens. The image is developed off kilter and is markedly trapezoidal in shape, much taller on right than left. What do we have to learn from the Clandestines?